Have confidence in your skin care with It Cosmetics! 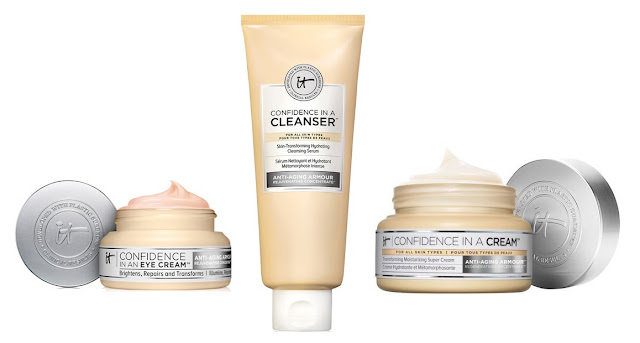 Confidence in a Cleanser Skin Transforming Hydrating Cleansing Serum - 148ml - $36 - a one-step skincare solution for all skin types to cleanse and hydrate while leaving skin feeling soft, refreshed and perfectly balanced. With a sulfate and soap-free formula containing proprietary Anti-Aging Armour Rejuvenating Concentrate to help skin appear rejuvenated and restore moisture; along with anti-aging collagen, hyaluronic acid, colloidal oatmeal and a super ceramide complex - ingredients that work over time to deliver dramatic results. Best of all it removes all traces of makeup - even waterproof eye makeup - so your skin feels completely clean without being tight. Confidence in a Cream Transforming Moisturizing Super Cream - 60ml - $62 - an ultra-hydrating moisturizer that absorbs quickly and boosts skin's natural regenerative cycle to rejuvenate, repair and restore skin for softer, smoother, younger-looking results with a proprietary anti-aging armour rejuvenating concentrate that's activated upon contact to immerse skin in moisture and reduce the look of pores, discoloration and key signs of aging. The exclusive concentrate combines collagen and hyaluronic acid to visibly plump fine lines and wrinkles, while niacin, peptides, a super ceramide complex, and other active ingredients smooth texture, intensely hydrate, and enhance firmness. Confidence in an Eye Cream Brightens, Transforms and Repairs - 15ml - $48 - transforms the entire eye area - from helping to restore the look of firmness to reducing the appearance of puffiness, dark circles, lines and wrinkles - and is safe for even the most sensitive skin. Brightens the look of eyes to make them appear instantly more awake with an exclusive apricot tint to visibly colour-correct and Drops of Light Technology; proprietary Anti-Aging Armour Rejuvenating Concentrate and other high-performance skin-loving ingredients - including a super ceramide complex, chrysin, licorice root, avocado and squalane - work to hydrate, smooth and refresh - and look forward to more dramatic results over time. Have no fears, this isn't one of those weirdly tinted products that make it look like you have blotches of colour under your eyes - it blends right in and really perks thing up making you look like you had a really good night's sleep! Available at Sephora stores across Canada and online at sephora.ca, ITCosmetics.ca and theshoppingchannel.com.